Who is as happy as I am about the weather warming up this weekend?! Yesterday I took the dog out in this outfit without a coat and wasn’t one bit cold while taking pictures (hooray… I have been putting off pictures because of the horrible weather). Anyway, it was such a fun weekend! Got to go bowling on Friday night for a friend’s birthday, otherwise my boyfriend and I just hung out, watched a few movies and relaxed with the pup! 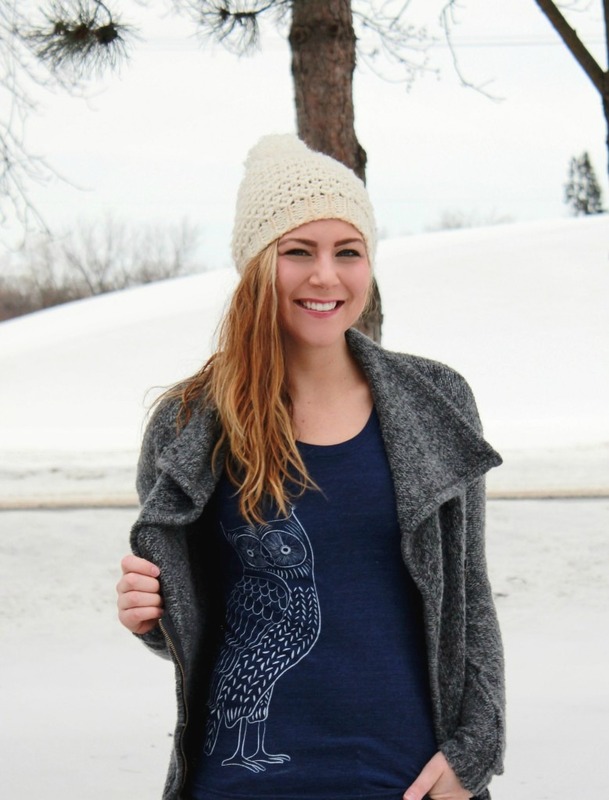 I love this owl t-shirt from Skip N’ Whistle, it is so fun and I can’t wait to wear it this spring and summer too! Hope you had a great weekend… and have a wonderful week! You look so pretty, love this layered outfit. Your hair has been looking so fabulous lately, can I just say?! TELL ME ALL YOUR SECRETS! I don’t know that I have any secrets haha! Just trying to take better care of myself and CARE more about myself all around. Going to bed before 10:30, drinking more water, RELIGIOUSLY using MyFitnessPal because it helps keep me on track, working out up to 4 times per week (usually a mix of cardio and lifting for either arms or legs) and just being happy. Taking time for myself! Which usually means taking naps with my dog, taking a long, nice bath, reading, watching movies, drinking lots of tea! And by caring about myself, it means I am taking more time to get ready in the morning. IT IS CRAZY how much of a difference it makes on your confidence to spend like 10 extra minutes on makeup/hair/choosing an outfit! And thank you so much for the compliment. Honestly I think I am just becoming more confident and that, above all, shines through! Your pom pom hat is super cute! It warmed up here too the last few days and it feels amazing! Cute and cozy snow day look! Your tee is so cute. My sister would love it. She is obsessed with all things owl and teaches at a school where the mascot is an owl. How cute!! Love that adorable owl tshirt. Sounds like you had a nice relaxing weekend. Glad the weather is warming up! I adore this outfit so much! The sweater looks super cozy, but I also love the owl t-shirt! Very fun! I love a good hat- I would wear one all day if I could…then I wouldn't have to do my hair haha! 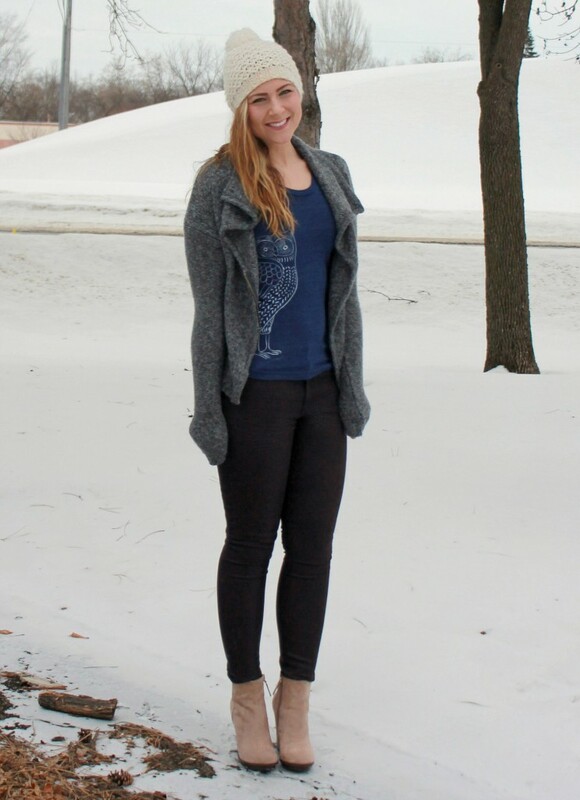 Your outfit looks so warm and cozy- love it! I love a good hat- I would wear one all day if I could…then I wouldn’t have to do my hair haha! Your outfit looks so warm and cozy- love it! haha me too! That’s why I had to have this shirt! Lovely pictures! You look adorable and Im so glad its getting warmer outside! Adorable!! I love the top! Love that owl shirt! Such a cute outfit.